As I stated in one of my previous posts, my son who is 23 years old, got a job two months ago with a financial company. He is working part-time – 20 hours a week. His employer offered him retirement benefits like 401(k) from day one. In his group, there are 18 employees. Only one is his age and he is friends with my son from his elementary school days. The rest are older. His friend has joined the 401(k) from day one – about 10% of his weekly pay. My son so far is hesitant to join the program. He said it’s a hassle. I said what hassle? The company is doing everything like managing the account. All you have to do is sign just one paper and that is it. It seems the younger you are, retirement seems more like a hazy mirage in the far-off future and they kind of trump long-term over short-term considerations. That’s the basic problem. At whatever age, you just want to spend, spend, spend regardless whether you can afford something or not. Instead you ought to have the willpower to save, save, save. Remember, the so-called rainy day is not far off the horizon of your financial life. Change your mindset so saving comes naturally to you. Like my son, some folks just can’t even sign a piece of paper. I mean they can but they won’t. The retirement account is managed by your employer so you don’t have to. You just might want to revisit your retirement savings once a year or so. What’s so difficult about that?. Change your mindset so you are not afraid to save for retirement. As you progress in your career and earn more money, try to increase your savings effort as well. Here comes the question of debt. 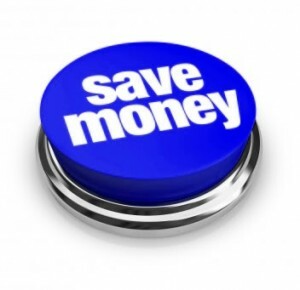 You can only increase your savings over time if you avoid unnecessary debt. Mortgage and car loans are necessary – in most cases – but you have to adjust it such that you can afford it without losing your livelihood. Change your mindset so you regularly and consistently save. Laziness is not a substitute for prudent financial stewardship. It’s not an easy thing to do to save for retirement when you are 23 years old. And I commend anyone in this age group who actually has the cash flow to cover all liabilities and still have enough to save for a rainy day, let alone retirement. Compound interest makes every dollar you save in your twenties worth many multiples more than dollars you save in your thirties, forties, and fifties. I tell my son even $100 a month can turn into tens of thousands when amortized over thirty or forty years. 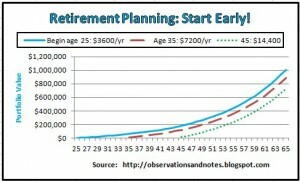 I agree many people cannot be bothered with savings especially younger individuals. Their need for things outweighs the desire to retire. That is absolutely right, Saving is not easy at all for the young. And this is completely normal. Young people spend a lot of money on so many things like entertainment and clothes. They want to enjoy their money to last penny after the many years of studies, and retirement is probably the last thing they think of ! Hi! I’ve been reading your website for some time now and finally got the courage to go ahead and give you a shout out from Houston Tx!